Black Friday email subject lines are perhaps the most important text for your email campaign this season. Why? It’s the first thing, aside from the sender name, that will be perceived by the reader to determine whether it’s worth the time to open and read. Of course, the tone of voice, sense of urgency, and creativity will vary by verticals and types of audiences you are looking to reach. Another rule of thumb: use vocabulary and phrases that your audience is accustom to. Here are some examples of industry verticals. Black-out This Friday. Hourly deals waiting for you to grab! Outfits worth a year’s purchases PLUS 2018’s Halloween custom 70% off! Limited time on Black Friday only! 50% off. Everything. This Black Friday, your furry friends will enjoy special treats 4x cheaper! Bark Friday! Special deals & free delivery on ALL purchases. This Black Friday, Mi Casa es Su Casa – Buy one get one free on all items! Make 2018’s fitness resolutions come true with Black Friday -50% at ___!! Animating your kid’s toy stories at all costs JUST became real at ___!!! BUY NOW!!! Bring all your kid’s toy stories to life NOW with BFCM offers at ___! Black Friday Deal: -50% on EVERY-thing! Black Friday is not enough: 1 super deal every day! -70% OFF on whatever you buy. Seriously. This is massive: -30% on new arrivals just for Black Friday! Free Tshirt for every Black Friday order! Example: Apple Black Friday Campaign seeks to drive in-store traffic. The rule of thumb dictates that Black Friday email campaigns must start building awareness about 2 weeks prior and intensify anticipation as time progresses. As more people choose to stay out of busy streets and cashier queues to enjoy Black Friday shopping from the comfort of their home, the need for brands to reach all possible digital channels is intense. Maximum visibility can be achieved via multi-channel campaigns, with integrated campaigns across online and offline channels which will spread awareness and create a top of mind effect to your audience. eCommerce businesses generally opt to gain from the Black Friday & Cyber Monday momentum. However, as of the past 2 years, some brands decided to go against the tide, and as a result, further distinguishes the brand ideal from the crowd. A good example of such is REI, a retailer for outdoors apparels. In email message was sent directly from REI’s CEO, Jerry Spritzke, to its customers announcing that REI is closing all the stores on Black Friday. By choosing to uphold its’ brand values as an outdoors gear retailer, REI was able to garner brand recognition for its core customer base. Although forgoing the potential sales for Black Friday, such brand marketing and choices will have a significant effect on the company’s bottom line for years to come. Black Friday is a great opportunity to make a difference with your ‘revolutionary’ marketing campaign strategy, starting with a set of attention-catching email campaigns and creative Black Friday email subject lines to create anticipation, grow awareness, traffic or better yet, long-term branding. Whatever the case, make sure your holiday marketing is planned to a T. All the best! 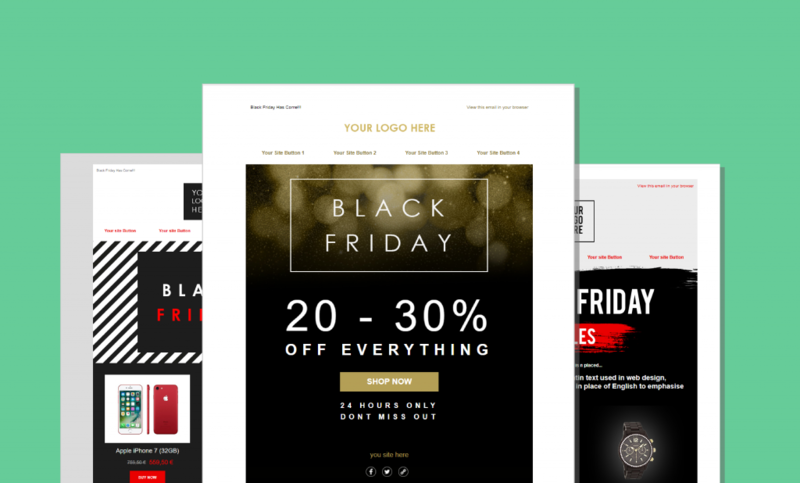 Apart from the Black Friday email subject lines above, we’ve also created 3 new Black Friday email templates that will help you build your promotion campaigns quicker. Getting your subscribers to open your Black Friday email campaigns is really crucial and this is why selecting an optimized subject line is important. However, while good open rates are correlated with higher sales, it doesn’t necessarily guarantee increased sales. For increased sales result on your eCommerce business, you’ll need a comprehensive marketing strategy that ties together the messages, offers, creatives and all channels you’re using to reach the right audiences. This article is meant to help you with that.